Knowing that the majority of visitors to our website are primarily interested in tools that can be used in the kitchen, the new Chef’s Choice AngleSelect 290 – 15/20 Diamond Hone Hybrid will certainly appeal to many. The reason is in the name. EdgeCraft have gone and produced a sharpener that caters for every knife you are likely to use in the kitchen. With the 20 degree angle selected, the Hybrid can sharpen traditional European/America style household knives. Using the 15 degree angle Asian style knives can be sharpened and honed. 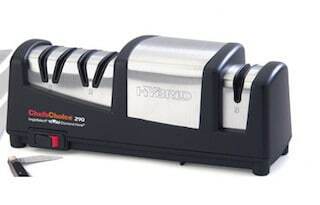 Versatility is the reason to buy the Hybrid 290, the 3 stage sharpener can also take care of your serrated knives, (including pocket and hunting knives). However, back to the actual product specifications. The AngleSelect 15/20 utilizes 100% diamond abrasive wheels, (pretty much standard in most chef’s Choice knife sharpeners these days). Here though the wheels sharpen simultaneously “into” and “out-of” the edge. Performance wise this results in a superior burr-free finish on your blades. Even after prolonged usage, very little marring occurs. Both stages one and two are electric, and have spring guided slots meaning all variation of knife thickness can be easily catered for. Stage 1 is dedicated to 15° edge knives and Stage 2 for 20° knives. Stage 3 is manually operated, and is used for polishing both types of knives as well as for sharpening serrated knives. The Angle Select 290 uses the EdgeCraft patented Criss-Cross® sharpening technology. 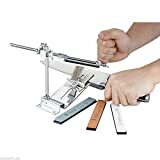 According to the manufacturers, this design feature provides a sharper edge than standard knife sharpening tools, and is safe for all quality knives. 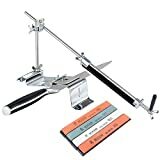 Online reviews often state that the sharpening performance of the Angle Select is of superior quality, with both the electric stages working with the blade instead of against it. 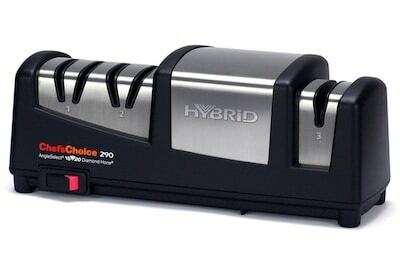 The Chef’s Choice range always look good too – the Hybrid 290 is no different. Contemporary kitchen or rustic country style, this product will look good on your worktop. Edgecraft superior design quality on a sharpener that is able to take care of both Asian and European style knives – with a sub $100 price point at the time of writing, this is definitely the sharpener to buy if you have a range of knives in your kitchen and do not wish to have a separate knife sharpener for the varying angle styles.